Last week, I was telling a friend I felt like making Cornish Game Hens that night for dinner when she exclaimed, "Holy cats! Doesn't that take a lot of time and effort?" I replied, "Nah, you just stuff 'em, tie 'em, wrap 'em and cook 'em." The thing about Cornish Game Hens is that they are SO tasty, and make a gorgeous presentation. And, this is one of those times when we can really believe the saying that beauty is on the inside, as it’s the things we’re going to stuff inside the hens that make them pretty delicious. Pick up a couple of Cornish Game Hens at the grocery store.They’re sold in two-packs most of the time, and this works out perfectly. You can either serve a party of four normal eaters half a hen each, or let one whole hen suffice for most of the meal for two. It really just depends on how you want to do side dishes. Make sure they’re properly and completely thawed out before beginning. Because they’re quite dense, they’ll take about three to four days to thaw in the fridge. Preheat the oven to 450, or the grill to medium heat. Chopped herbs mixed with softened (not melted) butter, salt and pepper, about 1/2 cup. Stuff everything into the two hens, dividing the ingredients equally. Tie the legs closed. Sprinkle with Kosher salt and freshly ground pepper. Wrap each in double-thick aluminum foil, making it a ‘pocket’ so there’s space between the foil and hen. 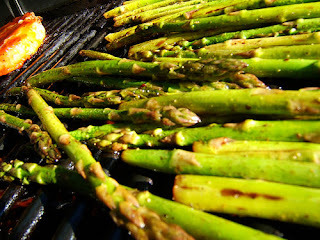 Throw them in the oven or on the grill, and cook for 45 minutes. Unwrap and pull a few of the garlic cloves and onions out so they rest attractively next to the hen on the plate. Sprinkle with a few pinches of chopped herbs and enjoy!